Canadian newcomer, Ryan Macdonald, steps up on short notice to take this fight with Chris Gutierrez. Standing 5’11 at bantamweight, I wonder whether Macdonald will be depleted having less time to cut weight than usual. The Canadian has serviceable offensive striking, but I don’t rate the other aspects of his game. He doesn’t appear to be a great athlete, is supremely hittable, doesn’t stuff takedowns well and doesn’t offer much off his back (although he looks like an okay grappler when he’s in a dominant position). One thing I noticed about Macdonald is that he’s heavy on his lead leg. Gutierrez utilizes oblique and calf kicks effectively – I wouldn’t be surprised if he seeks to immobilize Macdonald early on in the fight. I absolutely think Gutierrez is the more technical striker in this match-up, and benefits from having longer to prepare. I also think he’s the better grappler and should be able to land takedowns if things get dicey on the feet. Sure, it’s possible Macdonald has improved during the long layoff after his last fight, but based on the footage available I believe Chris Gutierrez should be more than a -170 favorite. I don’t think we’ll ever see Marlon Vera near title contention, but he’s a workman that will fight for your money. On the feet, the Ecuadorian has some nasty kicks and knees – although he hasn’t got much in the way of pure boxing. As a grappler, Vera can lock in opportunistic submissions but doesn’t seem to have the wrestling to put opponents on their backs. Vera’s core assets are his durability, heart and savagery. I can’t remember the last time Vera won a first round in the UFC, but he never checks out mentally and will rally from behind – much to my dismay as I bet Guido Cannetti against him. Entering his athletic prime at 26-years-of-age, he will be twelve years younger than his veteran opponent, Frankie Saenz. A quintessential wrestle-boxer, Saenz is scrappy on the feet and blends in his takedowns well. He doesn’t mind faking a shot in order to confuse opponents, which in turn opens up his striking. Saenz isn’t the smoothest technician on the feet, but he’s awkward, in and out with his movement and puts together unusual combinations – ripping the body and head. Despite Vera being the more potent finisher, I wouldn’t be surprised if Saenz lands the cleaner shots standing. Obviously Saenz will look to take this fight to the mat, since Vera is hard to put away and positional control represents his best path to victory. I’m confident Saenz can land takedowns, but I question whether he can hold Vera down for three rounds. Despite being 38-years-of-age, Saenz has not shown any shortcomings in terms of cardio. If Saenz dominates on the mat for round one and then randomly walks into a knee from hell, I won’t be overly surprised – since most of Vera’s fights go that way. However, I definitely think it’s plausible Frankie Saenz can wrestle and box his way to victory so I’m taking my chances at +140. Despite suffering defeat at the hands of Liz Carmouche in her UFC debut, there were positives you can take away from Jennifer Maia’s performance. Firstly, her striking looked smoother than I remembered from her Invicta FC bouts. She keeps her chin tucked and her hands high, is intelligent with her shot selection and is strong in the clinch. Alexis Davis also had her moments in her last fight, which was a defeat at the hands of Kaitlin Chookagian. Her offensive striking looked pretty solid, although she still took a tonne of damage and needs to tighten up her defense. Davis will always be a grappler first and foremost, drawing on her background in both Japanese and Brazilian jiu-jitsu. Alexis Davis is not a fantastic athlete and has struggled to get takedowns in the past. Her best takedowns come in the clinch where Maia is strong, so I question whether she’ll be able to drag the Brazilian to the mat. If this fight remains on the feet, I can see Maia landing the more eye catching shots in order to the take decision in the eyes of the judges. Perhaps Alexis Davis will land a takedown and steal a round, but I definitely think the value is with Jennifer Maia as a +143 underdog. I bet Bobby Moffett in his last fight, feeling he was the more complete MMA grappler than Chas Skelly. Aside from getting his back taken, he put on a good performance (despite the controversial ending). One thing I took away from the performance was that his hands looked infinitely sharper – he’s clearly improved from when he got starched by Thanh Le in 2018. While not the fastest guy in the world, Moffett is a good cardio athlete and could be a contender if he keeps improving. Training at one of the best camps for the lighter weight classes, The MMA Lab, I think “Wolfman” has a pretty high ceiling. Bryce Mitchell enjoys killing cats in his spare time and doesn’t seem like the smartest guy in the world. He said he was invited to train at the world class AKA gym, but declined as he has fifteen puppies to take care of. I feel that Mitchell’s offense is a lot better than his defense, both in terms of striking and grappling. He’s certainly the more dynamic striker in this contest, but I wonder if Moffett’s boxing has continued to improve? While Mitchell is the younger fighter, he’s training at a small gym in Arkansas while Moffett is working with world class sparring partners every day. Mitchell’s worst attribute is his gas tank, which has failed him on numerous occasions. He says he’s been working on resolving this issue, but I’ll believe it when I see it. Moffett has never shown cardio issues and I would expect him to come on strong in the second half of this contest. If the same version of Mitchell and Moffett show up from their last fights, it’s hard not to favor the fighter from The MMA Lab. If Moffett loses, it’s probably because Mitchell shows improvements that aren’t discernible from his existing footage. I’m not in love with the -170 price tag, but I think Bobby Moffett gets the job done. As one of the few flyweights with knockout power, it’s no surprise Deivison Figueiredo is one of the most exciting prospects at the lighter weight classes. It’s a shame that the division is in chaos as I’d really like to see how he matches up against the top competitors. Figueiredo isn’t the most technical fighter in the world, but he is a savage. When you can starch fools with one punch, you don’t necessarily need to be the most fluent striker – hence his single shot approach. He’s also a reasonably proficient grappler, although presumably won’t want to go to the mat with a jiu-jitsu wizard like Formiga. As the UFC’s #2 human backpack, Formiga is an excellent positional grappler with good takedowns. In fact, I think he’s the more technical striker in this contest as well – he seems to be working on this aspect of his game at American Top Team. If Formiga can score a takedown, it’s likely he’ll keep Figueiredo down for the entire round (if he doesn’t get a submission). The biggest advantage Figueiredo has is his power, and that might be the most significant factor in this fight. 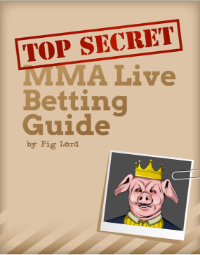 However, I’m a gambling man and I see enough advantages for Jussier Formiga to justify a play at +145. I didn’t have high hopes for John Makdessi against surging German prospect, Nasrat Haqparast. However, I feel this fight is infinitely more favorable. Since moving to Roufusport, Makdessi has revitalized his career. In his last performance he looked better than ever, beating Ross Pearson in a technical striking contest over three rounds. Makdessi is also a hard guy to take down, not that Pinedo is much of a wrestling threat. Although young in his MMA career, Jesus Pinedo has not impressed me in the fights I’ve seen. In fact, he easily could have lost to Devin Powell in his last contest – if it weren’t for Powell flopping to his back like a fish on a number of occasions. Pinedo is primarily a striker, but he’s fundamentally deficient. He throws a lot of crazy looping shots and probably needs to move to a bigger camp if he wants to reach his potential. I think this is a tailor made opponent for John Makdessi and I had no problem playing him at -240. I’m not going to spend too much time on this one. Coming from a Taekwondo background, Anthony Pettis is one of the flashiest strikers in the lightweight division. He usually has the advantage in a kickboxing match at distance – but he won’t against Stephen Thompson, who is a full sized welterweight and a master of the outside game. Pettis is opportunistic with his submissions, but I don’t see him taking Thompson down. 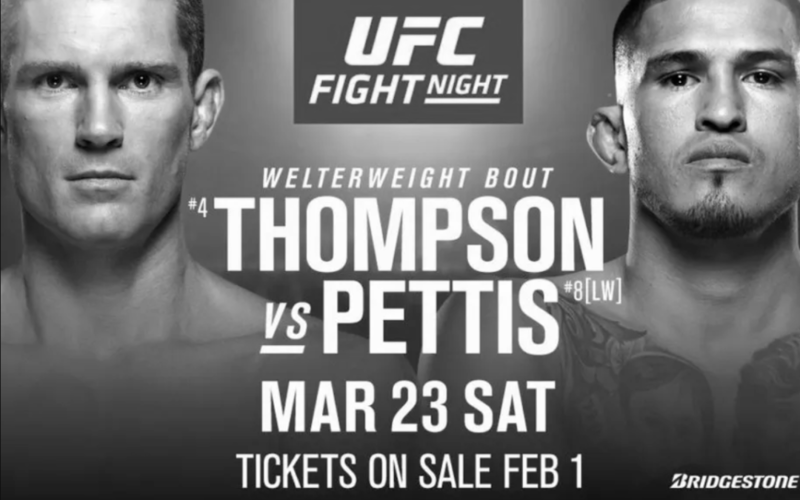 I think we most likely see Thompson landing the cleaner strikes over five rounds to take a clear decision victory (Pettis can probably hang in there as he is durable). If you want to use Thompson as a parlay piece, I’m not completely against it but his price is -400 which entails an 80% implied probability. I don’t think there is much value there. If I had to pick a play for this main event, I’d probably go with fight goes to decision at -110.